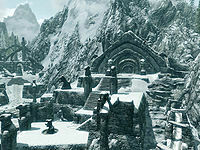 Hjaalmarch is a hold in northern Skyrim, with its capital in Morthal. It is initially affiliated with the Empire, though the Jarl laments the war and reportedly co-operates with the Empire only as far as their goals align. It can, however be captured by the Stormcloaks after completing A False Front and The Battle for Fort Snowhawk. Despite its position just east of the capital of Skyrim, Solitude, Hjaalmarch is remote and isolated. 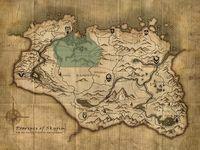 The enormous, festering swamp dominating the northern part of the hold could be a factor, as could be the tall, snowy mountains in the south, and the ancient, cursed city of Labyrinthian blocking a possible trade route to Whiterun Hold. 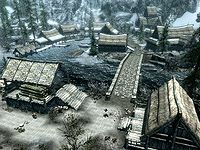 Hjaalmarch is one of the poorest holds in Skyrim, second only to Winterhold, and is sustained by the Morthal lumber mill and the mining town of Stonehills. Jarl Idgrod Ravencrone takes a hands-off approach to leadership; her people are unhappy with her governance and several will complain openly. Hjaalmarch is well-known for the salt marshes which dominate the north and central areas of the hold, stretching from Fort Snowhawk in the west to Ustengrav in the east, formed by the River Hjaal breaking into many tiny streams. Much of the rest of the hold more resembles neighboring holds, for example, in the south and east of the hold, the terrain is more resemblant of the Pale along the border with that hold - snowy pine forest and plains broken up by crags around the Stormcloak camp and Ustengrav. The southern half is mountainous terrain above the snow line, although in the west, the mountains give way to the Hjaal river valley, where the climate is more resemblant of neighboring Whiterun Hold. Beyond Fort Snowhawk, in the hold's western extremities lies a pine forest, much like those found just across the Karth River in Haafingar. 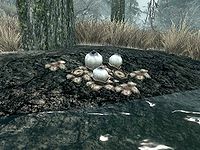 The swamp boasts the highest numbers of wild deathbell plants in Skyrim, as well as being the only place to find swamp fungal pods and giant lichen. Other plants include canis roots, mora tapinella, spiky grass and a few scattered nightshade plants. The snowy areas have few usable plants besides the humble snowberry bush, but there are some blue and purple mountain flowers to be found, with the blue variant especially abundant around Morthal. As for fauna, all manner of beasts roam the swamp; even chaurus might ambush you at night, but more commonly frostbite spiders and trolls lurk between the trees. Of course, mudcrabs are always in abundance, from the swamp to the banks of the River Hjaal. Your typical predators, bears and sabre cats, and their prey, deer and goats, roam the south, but there are also more trolls to watch out for. Passive creatures include large amounts of fish in the shallow waters with dragonflies circling above. A single paved road runs from the west near Dragon Bridge, past Fort Snowhawk (where the residents may attack you even if you stay on the path) and Morthal, curving north around the Stonehills area before entering the Pale. The most notable pathway starts southwest of Stonehills and ends in Whiterun Hold between Hamvir's Rest and Silent Moons Camp, passing through the ruins of Labyrinthian along the way. 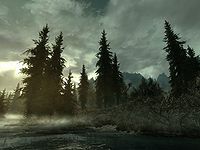 Other paths run from the road east of Fort Snowhawk south to Dead Men's Respite, and north from Morthal to Movarth's Lair. Beyond that the swamp is pathless, however, so beware of getting lost. All locations in Hjaalmarch with individual map markers are listed. There are a few places without map markers listed for their significance. Bromjunaar Sanctuary — A hidden location that can be reached by equipping the wooden mask. There are three Dragon Mounds in Hjaalmarch. West of Dead Men's Respite. Kill Lurbuk: Silence a terrible bard, permanently. With Friends Like These...: Repay your debt to the Family, and show you are willing to kill on command. Kill Maluril: Kill Maluril in Mzinchaleft. MyrwatchCC: Locate and enter a mysterious tower. Rising at Dawn: Track down Falion to rid yourself of vampirism. In addition, many miscellaneous quests are located in Hjaalmarch. They are listed here. This page was last modified on 25 November 2018, at 19:57.